When was the last time you ate balut? Do you really eat balut? How about eating a balut in a fancy restaurant? Do you even think that it is possible? Probably if you live in New York, Paris, or Sydney. 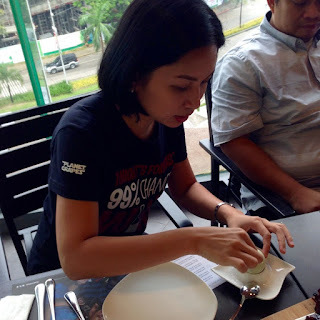 In Cebu, the most unusual place that I tried balut was in Planet Grapes at the new wing of Ayala Center Cebu. Planet Grapes is a restaurant that boasts of a solid wine selection to be paired with their food. This restaurant is hell-bent on converting Filipinos into wine drinkers that they do not offer any other alcoholic beverage except wines. Are you craving for beer? You better go somewhere else. The company's tagline is "Wine without the drama". When I was informed that they have balut on their menu, I was stunned. No drama? Yet, in their menu is a pretty interesting character and the balut is the protagonist of this blog post. I have not eaten balut for years, but I just had to order one. Meet the balut's leading lady. Her name is Lhady Dizon. Quite an apt and interesting name for a leading lady, but I forgot to ask why her name had an extra h. The pretty girl with Alden-like dimples is the brand manager of Planet Grapes. She is from Bulacan and grew up eating balut. She demonstrated to me how to eat Balut at a fine-dining place. At Planet Grapes, your balut is served in a nice-looking egg saucer with fine sea salt on the side and a teaspoon. Since it is an upscale restaurant, you have to use the teaspoon to crack the egg. Our protagonist has a soft exterior and you do not really have to use much strength to break it. After a few taps, you can see cracks. Make sure you tap it at the top portion. Looking at Lhady, I was so impressed with her finesse on peeling the shell of the balut. She was not kidding about eating balut regularly since childhood. You have to be careful that the hole you make is not too big or else the delicious broth will be spilled. Salt is probably the best seasoning for any kind of egg. It is also the preferred condiment for most balut eaters. Some also like vinegar, chili, garlic, and onions with it. In Lhady's case, she sprinkled her egg with salt. The protagonist is now under the hold of the leading lady. The climax is near. Look at how Lhady held the balut like a shot glass full of tequila. The highlight of eating balut is sipping its flavorful broth. Some people love to prolong this part. If it were a play, this would have been the climax. After the broth is sipped, the protagonist is totally undressed. After removing the shells, you can see what the balut is made of. Depending on how old it is, you might see some balut looking like more of chick than an egg. The balut is eaten. It was a tragedy for the balut, but it was one big comedy for the tummy of the leading lady. The ending is kinda dramatic for a place that wants no drama. I also had a chance to eat my balut. It was pretty good. I actually like it so much that I wanted to go back at Planet Grapes to have some more after writing this post. The balut actually pairs well with some dry white wine. The Intrepid Pinot Gris 2013 was perfect for it. The medium-dry white wine had the acidity and aroma to balance the balut's inherent traits. I was not able to fully appreciate it though because I only had a sip (25 ml). If I had a glass of that wine from New Zealand, I could have finished one or two more balut eggs. Planet Grapes is located at the 4th Level of Ayala Center Cebu New Wing.